I have been fascinated by the design of the Metaphys Locus ever since it showed up on JetPens a few years ago. I wasn’t familiar with the brand, but after a little digging and reading, I learned that Metaphys is essentially a collaborative design shop involving some of Japan’s top design talent. Their goal is to rethink and rebuild common every day objects in innovative ways, and the Locus Multi Pen is the result of one of their projects. A 2008 Good Design Award winner, the Locus is beautiful to look at. But as with all good writing instruments, performance is where it is at - for me anyway. 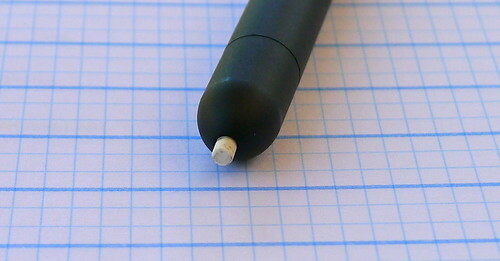 The 0.5mm ballpoint writes wonderfully, the 0.5mm pencil functions well, and the most unique part of this pencil - the eraser - is incredibly handy. It feels great in the hand, and is a real head turner. All of that said, there is one kicker - the price. At over $80 you are making a real commitment to this multi pen. The pen I reviewed is one of our test samples at JetPens, so I didn’t come out of pocket for it myself. I’m not sure that I would either, mainly because I have a hard time sticking with just one pen, and therefore the cost would be hard to justify. If you are looking for a unique pen for yourself or as a gift though, then the Metaphys Locus might be just what you are looking for. 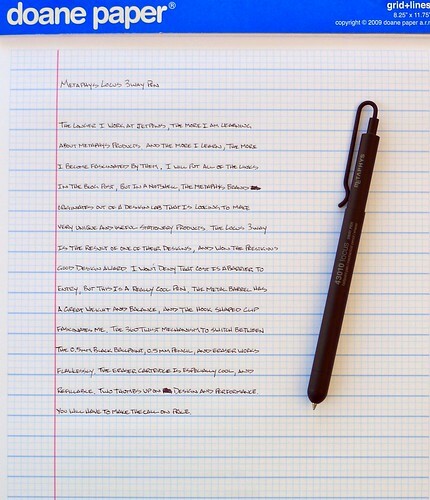 Posted on September 12, 2011 by Brad Dowdy and filed under Metaphys, Multi Pen, Pen Reviews.